EFF has written extensively about the worsening situation for bloggers in Vietnam, supporting campaigns to free high-profile bloggers such as Le Quoc Quan and Dieu Cay, and criticizingVietnam’s Internet censorship bill. This report will analyze malware targeting EFF’s own staff, as well as a well-known Vietnamese mathematician, a Vietnamese pro-democracy activist, and a Vietnam-based journalist at the Associated Press. EFF is greatly disturbed to see targeted malware campaigns hitting so close to home. While it is clear that this group has been targeted members of the Vietnamese diaspora for some time, these campaigns indicate that journalists and US activists are also under attack. 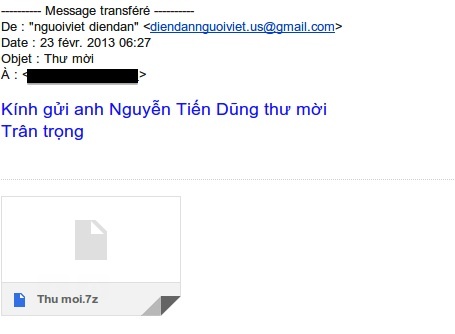 And while longtime activists and journalists might expect to be targeted by a state they regularly criticize, it appears that a single blog post is enough to make you a target for Vietnamese spying. PREVIOUS STORYWhat In the World Is This Weird Object On The Moon? NEXT STORYThe $23 Trillion Credit Bubble In China Is Starting To Collapse – Global Financial Crisis Next?